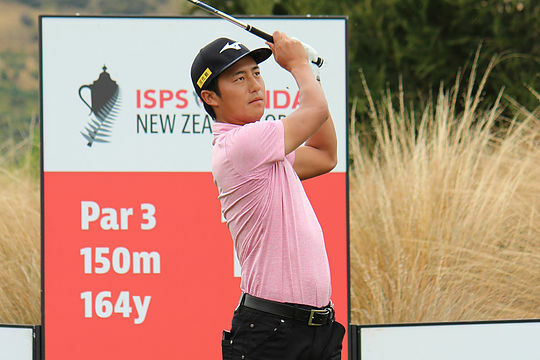 All the pressure was on the ISPS HANDA New Zealand Open field during the opening round in Queenstown, with benign conditions making good scoring crucial. Queenslander Daniel Nisbet, United States professional Jarin Todd and Japan’s Tatsuya Kodai made the most of welcoming greens freshened up by morning drizzle. Nisbet ran in six birdies on the back-9 at The Hills, while Kodai also came alive with some music of his own at The Hills for 63, and a similarly faultless round. Asian Tour player Todd scored eight birdies over 11 holes at the par-71 Millbrook Resort. Kodai, a previous winner on the Japan Tour, set about attacking pins from the fairway. “I enjoyed playing with this pro-am format, which led to today’s score. The course will change tomorrow, but I want to aim for a big score,” said Kodai. Nisbet, who first came to Queenstown as a caddy in 2010, was also happy to make the most of the limp pin flags. “It was a pretty solid day, just keeping bogeys off the card. It is always a goal to go bogey-free and then get a couple of close ones which were a bonus,” he said. Todd won’t be regretting his decision to come to New Zealand after being handed a flyer by New Zealand Open tournament promoter Michael Glading in Indonesia, even if it wasn’t the perfect opening round. “I didn’t drive it very good. I started on 10 and I almost made it on both par-3s so that gave me some good momentum going into the back-9 and I rolled in some putts. I got a little lucky on the par-5 when I hit a bad drive but was able to make par,” he said. Andrew Dodt, a runner-up at the 2010 New Zealand Open and sixth last year, was an early frontrunner, his putter eventually glowing red hot with five birdies and an eagle for a 29 on the back-9 to finish 8-under the card. “It’s all playing well; it’s not going to get any easier than it is right now. You had to put the foot down today. The greens are pure, where you hit the putt that’s where it will stay,” said Dodt, who finished a shot behind the leaders and tied with fellow Australians Andrew Martin and Travis Smyth. Aucklander Harry Bateman is the leading New Zealander, at 7-under the card and tied for seventh, courtesy of an eagle and a raging front-9. “I started pretty wobbly. I hit it into the hazard on the first hole (10th) and scratched my way round the rest of the nine. I hit one in the water on my final hole,” said Bateman. Japan’s Shoukun Yamashita, playing as a paying amateur in the pro-am format, made the perfect start when he holed out with his first shot of the day at The Hills. Yamashita’s ace came with a rescue club on the 142m par-4 10th, securing him free entry into next year’s centenary event.